The "Kings of Advertisement" set off to a roaring start and garnered huge success as it witnessed creative ideas that made it to the top spot. 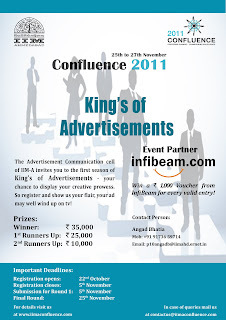 Following the success of the event, Infibeam announces "The Ad-Vent" contest, an open contest for participants. The Ad-Vent will be powered with ideas and scripts by 'The Viral Fever', a renowned creative agency for Digital Marketing and Branded Entertainment. The winning entry will get television coverage nationally and the winning artist will win cash prize. Ad-Vent has had a huge response and the event is gearing up to take the nation by storm. The aim is to work with aspiring artists and provide a platform for their creative work. Infibeam teams up with creative agency- 'The Viral Fever' in this initiative. The organizers believe it is a creative experiment and hope to see a kaleidoscope of creative ideas emerging from different parts of India. The Viral Fever believes there is no better way to understand the customer than to analyze his interpretation of the brand. Ad-Vent provides an idyllic platform for the same. Infibeam, India's leading ecommerce portal is currently at the top in the social media aspect. They have been pioneers of creative experiment and with Ad-Vent they will be adding a new dimension to their consumer centric profile. So, for anyone that enjoys art and creativity, the Ad-Vent is surely something to look forward to. Stay tuned to the contest and witness creative brains at work, bringing out the best in them and calling the shots at Ad-Vent. The best creative advertisement will hit your television screen shortly. 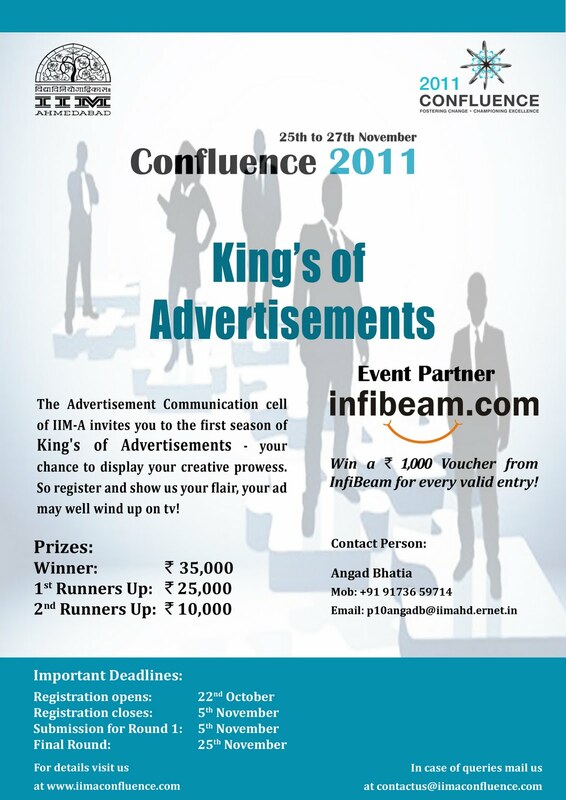 India's leading shopping portal Infibeam.com is happy to be associated with IIMA's Confluence 2011, an international B-school fest in Asia Pacific, held between 25-27th November, 2011. Infibeam has been one of the prominent recruiters at IIM Ahmedabad in the past couple of years and is proud to be associated with Confluence 2011. The competition to be held is known as the 'Kings of Advertisement'. It is an advertising and marketing contest. The main theme of the contest is "Fostering Change, Championing Excellence." Confluence is the largest B-school meet in India and attracts participants from across the world. It provides a platform for budding managers of tomorrow to apply their skills in different competitions and case contests, designed to challenge the brightest minds in the world. The participation will be in teams, comprising 2-3 students, who will have to submit short advertisements for Infibeam and follow up with submitting the complete Integrated Marketing and Communication plan for Infibeam in Round 2. The initiative will prove beneficial for Infibeam, a pioneer in providing innovative solutions in the ecommerce platform. Infibeam announces the Infibeam Logistics, its last mile delivery network. This is an in house logistics delivery system that offers fast and hassle free shopping experience. The impeccable logistics program is active and customers in Delhi, Gurgaon (Haryana) and Noida (UP) are availing the benefits. Infibeam has plans to expand the platform to other cities in the coming months. Since the launch, Infibeam has already delivered thousands of packages to customers in Delhi and the NCR region. The Transportation Management System platform will help track products and deliver them efficiently to customers. The Infibeam Logistics also ensures that customers can continue to expect timely and assured delivery of orders. That is not all; the detailed package tracking system along with the cash on delivery facility enhance the user experience. At present, the IL provides delivery, payment collection and other value added services to customers shopping at Infibeam.com. The company plans to expand the Logistics by hiring more delivery agents and expanding to other cities across India. Furthermore, Infibeam will selectively open up its logistics software platform as a service to small and medium courier companies. This will help the courier companies to manage and track packages more efficiently. The Infibeam Logistics, though in its budding stage is geared up to spread across different cities and offer customers the best in online shopping.